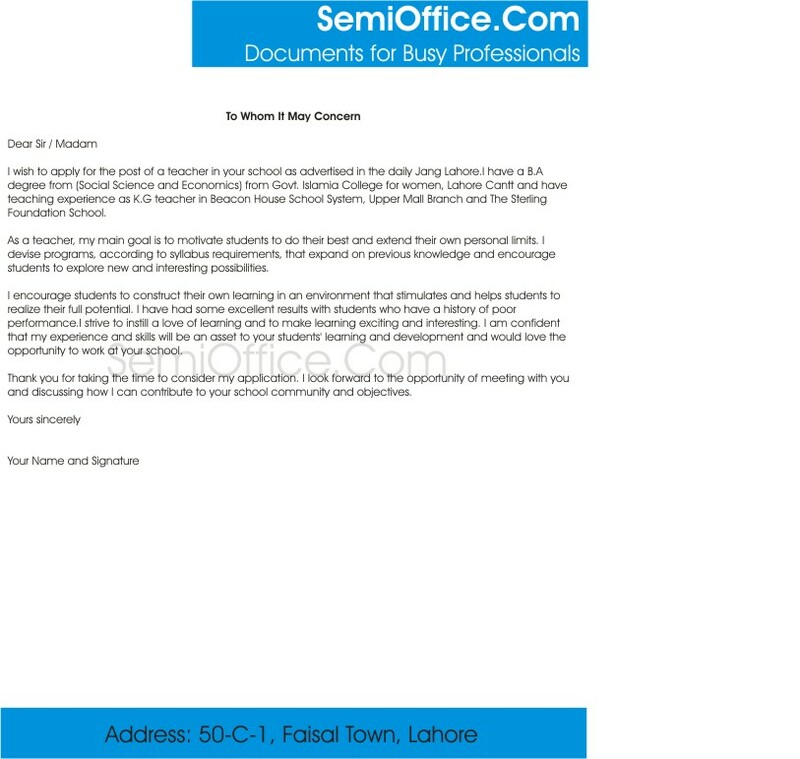 Sample letter for sending resume to schools for teaching job of KG or preschool kids. Teaching Job Letter is available for free download. I wish to apply for the post of a teacher in your school as advertised in the daily Jang Lahore.I have a B.A degree from (Social Science and Economics) from Govt. Islamia College for women, Lahore Cantt and have teaching experience as K.G teacher in Beacon House School System, Upper Mall Branch and The Sterling Foundation School. As a teacher, my main goal is to motivate students to do their best and extend their own personal limits. I devise programs, according to syllabus requirements, that expand on previous knowledge and encourage students to explore new and interesting possibilities. I encourage students to construct their own learning in an environment that stimulates and helps students to realize their full potential. I have had some excellent results with students who have a history of poor performance.I strive to instill a love of learning and to make learning exciting and interesting. I am confident that my experience and skills will be an asset to your students’ learning and development and would love the opportunity to work at your school. I came to know about the vacant seats of teachers at your institute with reference of my friends Sobia Yasin and Samreen Chaudary. I am highly motivated, enthusiastic and hard-working person looking for a job. I am sending my cv through email and waiting for a positive response from your side. Kindly attached my Cv for the post of Teacher. I am teaching in Beacon house Montessori Academy from past one year. With all respect I would like to inform you that I have applied for a job vacancy for a teacher through your online portal, but I would like to tell you that I have left the qualification section empty as I got married at early age and was not able to finish my degree but I assure you that I have knowledge of how to do task as I am giving home tuitions from last 3 years, I have a good experience and knowledge of all current books being taught in schools now a days. The only issue is that I have no specific degree and no official experience but I request you to give me chance to prove myself. I am looking forward for a positive response.